Anthony Joshua declared his fight with Alexander Povetkin is the start of a new chapter in his career and believes he has 10 more years in boxing. The WBA-IBF-WBO world heavyweight champion faces Povetkin at Wembley Stadium, where there is expected to be a sell-out crowd of 90,000 on September 22. Joshua (21-0, 20 KOs), 28, turned professional after winning an Olympic gold medal in 2012 and still lives in north London, not far from Wembley. “This is a new chapter in my career,” Joshua told a press conference at Wembley Stadium on Wednesday. “I think I’ve got 10 years left in boxing and I want to cement my legacy. “Because of science and information, I can go on that long. Bernard Hopkins did it. My friend Wladimir Klitschko went on until he was 40, Floyd Mayweather Jr did and I believe I can do it as well. “It’s not ‘him, him, him’ for me anymore. I have to look at the end goal. 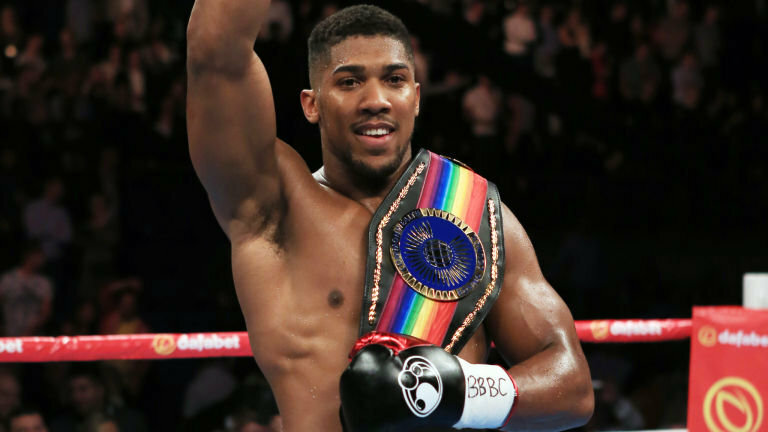 It will be Joshua’s seventh, third and first title defences of the IBF, WBA and WBO belts respectively. Povetkin (34-1, 24 KOs), 38, from Russia, will be the best opponent Joshua has faced other than Ukraine’s Wladimir Klitschko, whom he knocked out in the 11th round in front of 90,000 fans at Wembley last year. During the conference, Joshua was once again asked about a possible fight with American Deontay Wilder (40-0, 39 KOs), the WBC titleholder, after talks between the pair broke down before the end of the year. “It seems there’s always a lot going on around my fights, noise about who is next,” Joshua said.